Categories are used in WordPress to divide your posts out into sections so as to make your blog easier to navigate. These sections are majors blocks in your blogs subject field. An example of how categories section off your blog would be - if you are writing about your local rugby club then your categories would be senior team, junior team, ladies team, under 20's, under 19's ... under 8's, fundraising, social events. This allows your readers to find articles related to a particular team or another aspect of the club. 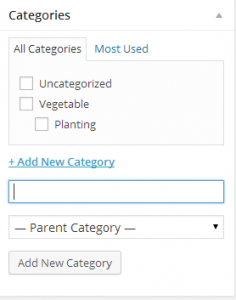 WordPress only has one category when it is installed "Uncategorized" so you will want to create your own categories. 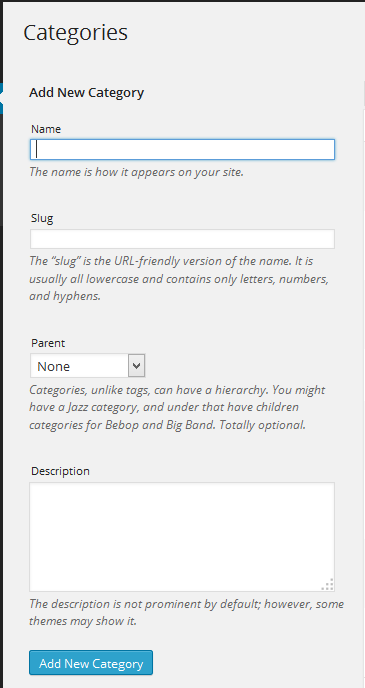 How to create a new category. 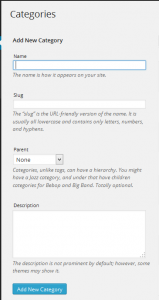 As with most things in WordPress there are several ways to create a new category. If you are on the main dashboard and you position the cursor over the Posts option a fly out menu will appear and you can select Categories from it. If you click on Posts the sub-menu will appear below it and you can select Categories. The other way to add a new category is on the Add New Post page. The categories meta box is on the right hand side of the screen and this is where you go to pick the categories that relate to the post. 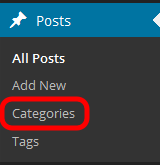 If you don't have a category that is relevant to the post you can click on the "+ Add New Category" button. When you click on the button the box will expand giving you a box to insert the name you want to call the new Category and if it is a sub-category a parent select list. Any of the three options above will take you to the main Categories screen where you can add, edit or delete your Categories. On this screen you can enter the name of the new category - in the case of the rugby example above this would be something like 'Under 14 Black Team' and a slug (a short URL friendly name) - for the example would be something like 'U14Blk' and a description of the category - for the example this would be something like 'Match reports and pictures for the Under 14 Black Team'. When you have finished click on the Add New Category button at the bottom. 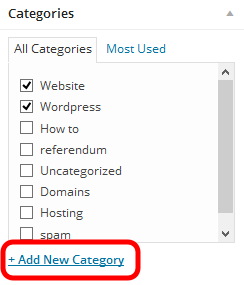 Now that you have a new category you will want to change the default Category that WordPress sets up when it is installed - "Uncategorized". For help with this you can used the "Change your default post category"